A new interactive map by the Los Angeles Times tracks 10 years of progress and setbacks of marriage equality in the United States. By scrolling through the timeline, you can see how each state has changed over time. If you scroll over to today, however, one state might look odd to you: California. 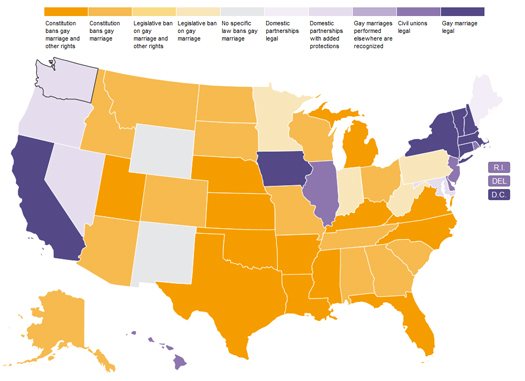 Currently on the map it shows the state in the “gay marriage legal” category. Technically, this is true. While gay and lesbians couples can’t yet get married in the state, Prop. 8 has been ruled unconstitutional. Unfortunately, the decision does not go into effect until the U.S. Supreme Court weighs in on the issue, by either deciding to hear the case and ultimately issuing a decision, or by deciding not to take the case. Confused by the map? The Movement Advancement Project has one which goes into greater detail.